Time and again, Reg proves himself one of the key songwriters of our age, and Faraway People is (even on the briefest of acquaintances) bound to be judged among his finest collections. I’ve been singing Reg’s praises for a number of years now, and even ten albums into his solo career he’s still coming up with the goods with perennially strong and distinctively compassionate songwriting. His 2015 album December was the first in a trilogy of releases conceived in response to those who’ve seen him performing live and want to hear him that way, just one voice and a guitar unadorned by studio treatments or distracted by complex arrangements and crowds of extra musicians. 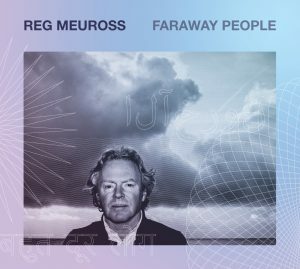 Faraway People is the second in that trilogy, and adheres to the same laudable credo – with minor concession in the shape of very occasional self-augmentation on banjo or harmonica. And, like its predecessor (and indeed, those albums before it) there’s an even consistency both in the writing and the performing, both in terms of style and quality. And there’s a curious thing: for I’ve happened to seriously cross swords with fellow-listeners of reliable musical taste, who have – unaccountably – remained steadfastly resistant to Reg’s talent, citing that very consistency as a major factor in why they don’t “get” his music. Their personal predilection may be for a more overtly dramatic delivery, a more radically challenging musical personality – against which Reg’s assured, smooth, softly melodious, easily accessible and yes, relatively gentle style might initially seem uneventful, bland even. I stress the word “initially”, for just a little effort (and a second playthrough) will enable an open mind and allow Reg’s lyrics to begin to make their mark. For his performing style is indeed deceptive, whereby he cradles his often extremely hard-hitting observations in a thoroughly congenial musical language that makes good, clever use of memorable hooks and refrains and seemingly effortlessly earworm-catchy progressions. Reg’s emotional commitment is second to none, though, and he shows a sincere and entirely genuine concern for the plight of ordinary people that runs right through his lyrics. Faraway People’s title song brilliantly exemplifies the above; here Reg takes a number of “case studies”, referencing undisguised real names of people who’ve been let down big-time by the ineptitude, inaction or just plain uncaring attitudes of successive governments. Reg doesn’t need to point the finger, for the facts tell it all in his commentaries – he’s even written an extra verse for this song in the wake of the recent Grenfell Tower fire (you’ll hear him perform this at a live gig). Other songs on the album deal, through retelling of, or reference to, specific real-life stories which bear a universal relevance: Refugee, For Sophie (This Beautiful Day) and The Lonesome Death Of Michael Brown all provide particularly poignant examples of this method. Such songs unashamedly tackle contentious issues and harrowing experiences, and are handled with extreme sensitivity and an unusual degree of insight into personal situations. Angel In A Blue Dress perfectly voices the thoughts and feelings of a nurse in the NHS whose job is made all the more difficult by persistent cuts in cash and resources – and yet it’s not an angry tirade, more a sanguine statement of resilience and coping that rings so very true, all expressed with tenderness and economy in well under three minutes. At the other end of the temporal spectrum we find the near-eight-minute Cicero, which is probably equal-parts commentary and philosophical tract; this song takes the idiom and call-and-response/refrain structure of Dylan’s A Hard Rain’s A-Gonna Fall (itself borrowed from folk-balladry) to voice, and expand on, eleven comments on occupations and social status by the Roman philosopher Cicero. And it’s a magnificent focal point and centrepiece to the disc. Balancing the songs of right-minded protest and political commentary, Reg also pens some highly affecting love songs (another trait he shares with Dylan…). Three of Faraway People’s tracks (New Brighton Girl, In Your Arms and In Dreams) come into this category, and celebrate (respectively) the power, the glory and the intense (though bittersweet) reassurance that romantic love can bring. There’s also a third aspect of Reg’s songwriting that can often overlap a little with the others – Reg has an acute eye for observation of humanity, and a gift for quirky depiction and interpretation of real or posited or imagined occurrences. Faraway People contains one example of each of these: the cheekily-titled Phil Ochs & Elvis Eating Lunch In Morrison’s Café (you couldn’t make it up!) based on Reg’s own close listening-in to this emblematic encounter in a motorway service area, and Leavin’ Alabama (a kind of “historical fantasy” which cleverly imagines a barroom meeting between Dylan Thomas and Hank Williams that could almost have actually happened!). Reg’s songwriting gift is such that even if you don’t get some of his actual temporal references and direct namechecks his message is clear and its communication unobscure(d). Time and again, Reg proves himself one of the key songwriters of our age, and Faraway People is (even on the briefest of acquaintances) bound to be judged among his finest collections.